Foot injury, from plantar fasciitis, Achilles tendonitis, ankle sprains, twists, heel spurs, swelling, fracture, splint issues, inflammation can be a downer for activity. 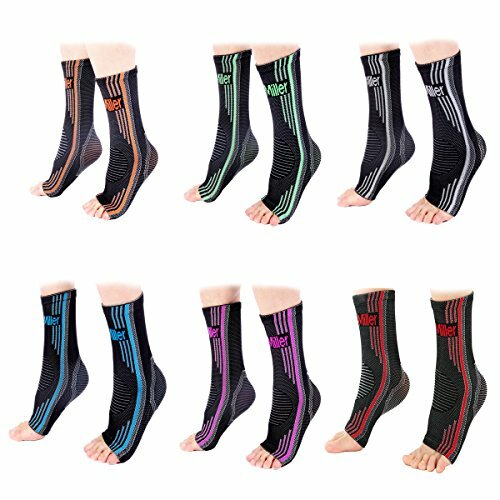 Getting a good compression sock for relieving chronic planter pain, fatigue, edema and throbbing can be difficult. 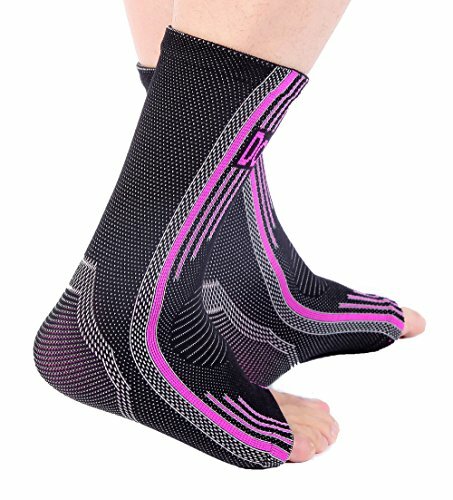 Here's a versatile foot sleeve that provides wearable massage therapy relief, molding around your leg for recovery, stability, range of motion & support. Care for your tendons, arthritis, swollen foot, fibroma, lactic acid buildup & use for treatment of a wide range of ailments. Use for ICE, Crossfit, Ballet, Weightlifting, Volleyball, Baseball, Basketball, Squats, Deadlifts, Soccer, Hiking, Golf, Tennis, Running, Walking, Exercise, Gym, Fitness, Workout, Tobilleras para futbol or as insole insert guards in your boots or shoes. Premium materials ensure best compression pressure by a natural hugging fit around nerves & muscles. Perfect for fallen arches, flat feet, ball of foot or bunion pain, Tailor's bunion, plantar fascial fibromatosis (Ledderhose's disease). All day & night relief for men women youth to the arch area by supporting ligament/fascia ensuring mobility by providing healing & therapeutic effect. 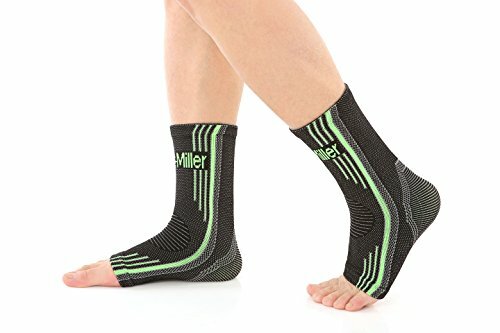 They are comfortable, brace / wrap your legs, act like an ace elastic support pro orthotic, provide superior targeted leg warmer relief by improving blood circulation & keeping feet breathable, stable, dry and cool. It stabilizes your feet, keeping out stress & pressure. 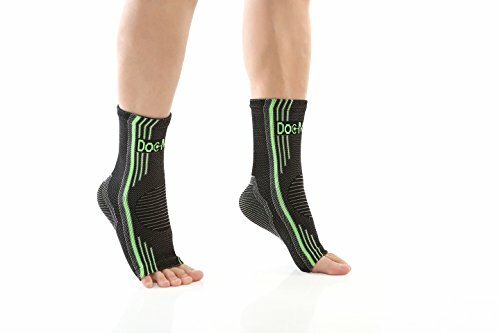 Fashionable design, not boring doctor ordered sock from the medical store. Available in Gray, Blue, Pink, Green, Orange & Red colors. If you don't like it, simply send it back! PROMOTIONAL PRICING IN EFFECT!! ONLY FEW AT THIS PRICE - GET THEM BEFORE THEY'RE GONE!! GREAT SAFEGUARD: Doc Miller Ankle braces apply perfect pressure across your arch, ankle and Achilles tendon, allowing you to get much needed relief and healing from a variety of common pains such as plantar fasciitis, Achilles tendonitis, swelling, sprain, arthritis, heel pain, spurs, and other throbbing foot. Wear them as foot warmers, or to protect your ankles during activity if you are prone to injuries. 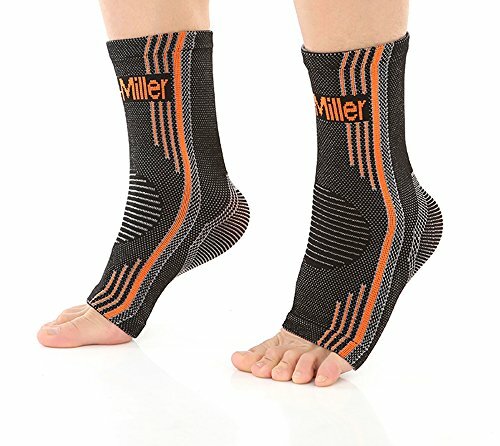 USE FOR WIDE RANGE OF ACTIVITIES: Wear them for range activities requiring good range of ankle movements such as Tennis, Crossfit, Baseball, Golf, Hiking and other court sports and gym activities. The sporty design is preferred by trainers and will ensure you fit right in with style, providing relief without restricting motion. Wear one on each ankle instead of just one. The open toe band design allows the right application of pressure in the splint, thus reducing inflammation. PREMIUM QUALITY MATERIALS: The ankle sleeves are made of the best materials, providing perfect form and comfort. The superior compressive fit is derived from form-hugging breathable fabric that don't constrict with a weave that makes it stylish, trendy and comfortable. Joint stability is maintained with perfect pressure applied at the most critical areas. This makes it a great therapy socks for a lot of foot ailments. ANKLE SLEEVES FOR YOU: Pick from the sizes and colors available. Medium for those with US shoes sizes 9 and under, and Large for those with US shoe sizes over 10. This measurement is good for both men and women. 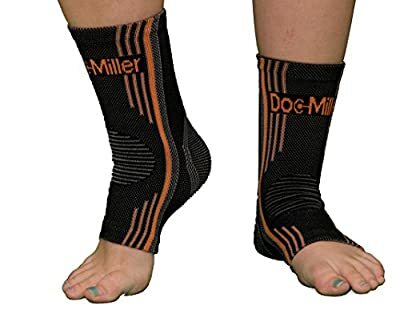 The larger the foot size, the more compression is derived and more probable therapeutic relief from swelling, swollen ankle and arch issues. EXCEPTIONAL VALUE + 100% MONEY BACK GUARANTEE: Sold as a pair. These sleeves are great for your feet and wallet. Buy more and lock in the low price. Know that when you buy from us today, you are covered by our 30 day, money back satisfaction guarantee & world class customer service! !